I’m so glad I’m not a fifties housewife! I’d like to apologise for the rather sparse nature of my blog posts over the last month or so. And I have to say this isn’t going to change much for the rest of the year. Rather like buses, books seem to have arrived in a huddle for me this year. The first six months saw me enmeshed in the fascinating and somewhat arcane world of the Women’s Institute, writing what had started as a simple cookbook commissioned to celebrate the 100th anniversary of the movement which takes place next year. As I wrote, it morphed into a social history of the last 10o years in this country, told through the medium of a hundred recipes, each with its own back story. I loved writing it yet breathed a sigh of relief as the manuscript went off to the publisher! I started to plan a leisurely summer, spending time in my garden and catching up on all kinds of bits and pieces, maybe seeing something of my family and getting on top of the work needed on my cottage to build a much needed new kitchen and extension. Then wouldn’t you know it, along came another fascinating project I couldn’t turn down. On a similar theme of the social history of food, this book is tied into a television series, Dinner Times, airing on the BBC in early 2015 – which means the publisher needed it fast. And as the series was based on the eating habits of the British over six decades from the 1950’s, and I was already up to speed on a lot of it because of my WI research, I was the ideal person to do it. So could I write a book – 70,000 words – in ten weeks? Of course, I said. So now that’s what I am doing! I’ve written the first 9k words this week and have been immersed in the move from austerity to affluence that happened in the 50’s. Tomorrow I move into the sixties. 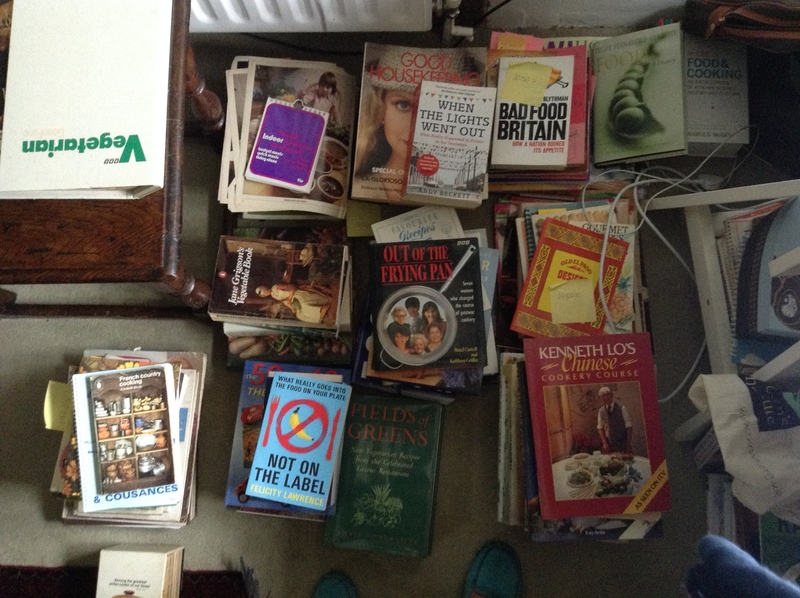 I’m surrounded by reference material from books and magazines from the period to social commentaries and histories from everyone from Andrew Marr to the wonderful Joanna Blythman. And yet again I have found the most intense personal resonances emerging as I research and write. The theme of women’s part in the new consumer boom of the period and the place created for them in the new dream kitchen at the heart of the home is a fascinating one, and the pressures to be the perfect housewife, hostess and mother are evident in all I read. 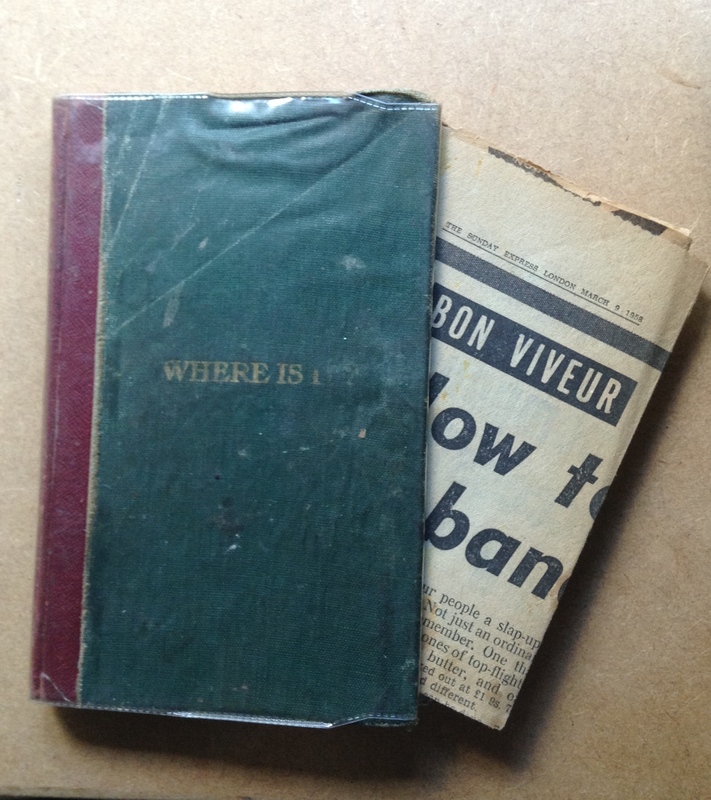 The pile of cookery books and notebooks my mother passed on to me before she died have provided a very personal snap-shot of her life in the late 50’s. As you can see, I am sitting here at my desk surrounded by fascinating books and magazine articles and all kinds of commentaries. But a small A5 recipe notebook that my mother handed on to me in a pile of books before she died has really touched me in the context of what I am discovering about the way food has influenced every aspect of our lives. 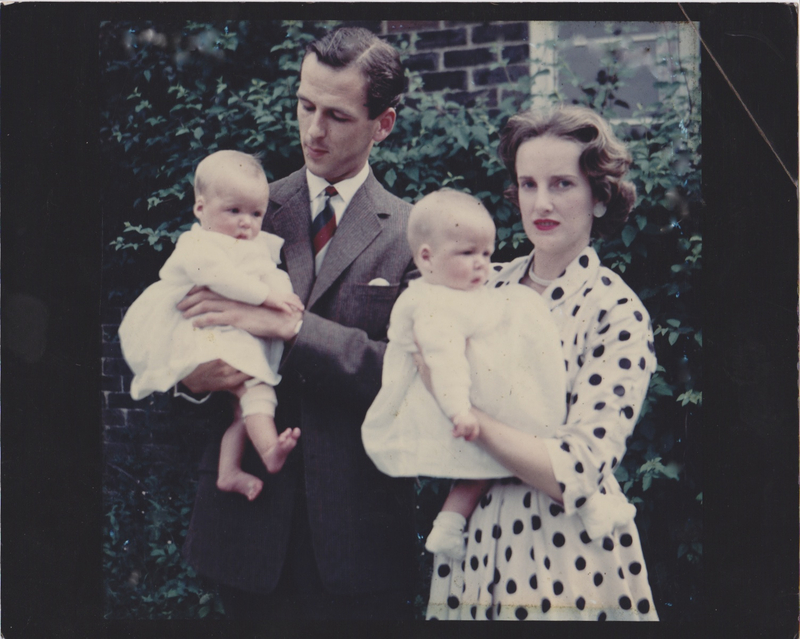 And it provides a revealing and poignant image of the concerns of the young wife she was in March 1958. This little book, with recipes in her handwriting for Goulash, beef stroganoff and cheese souffle next to a note to call the chimney sweep, also holds a browning newspaper cutting taken from the Sunday Express of March 9th – ‘How to put on a banquet for 30/- and still have time to be the serene hostess when your guests arrive’. I’ll let you know more about the book and the television series it supports over the next few months as I visit each decade up to the present. 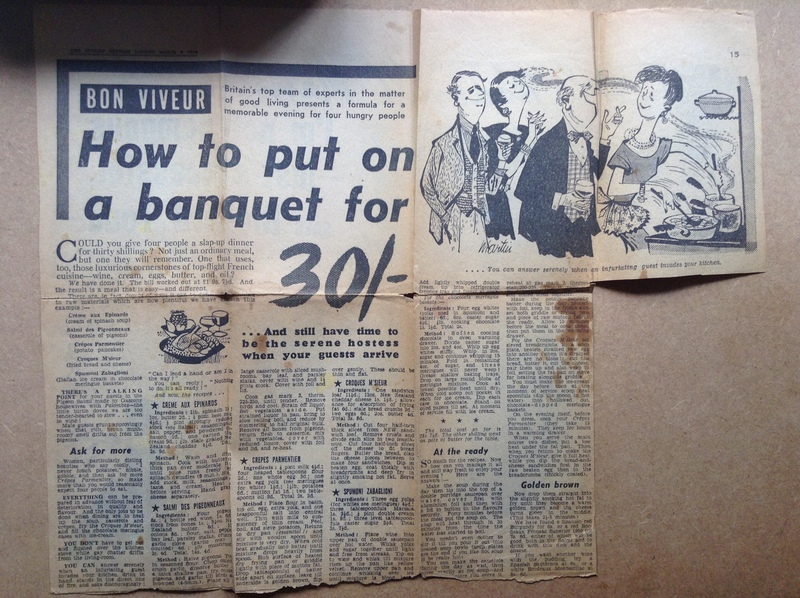 This entry was posted in Food history and tagged 1950's, 1950's menu, 50s dinner party, 50s housewife, dinner party cooking, DInner Times, Sunday express, WI centenary e, Women's Institute. Bookmark the permalink.